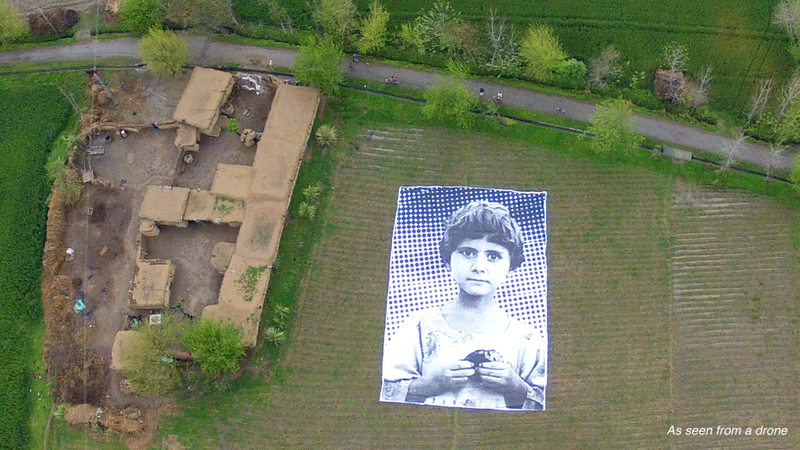 The installation is a huge picture of child that the drone operator can see and is meant to disrupt the pilot’s ability to dehumanize the victims of the strikes. To [John] Brennan the people of north-west Pakistan are neither insects nor grass: his targets are a ‘cancerous tumour’, the rest of society ‘the tissue around it’”. there is a common metaphor in which military control by the enemy is seen as a cancer that can spread. In this metaphor, military “operations” are seen as hygienic, to “clean out” enemy fortifications. Bombing raids are portrayed as “surgical strikes” to “take out” anything that can serve a military purpose. The metaphor is supported by imagery of shiny metallic instruments of war, especially jets (Lakoff 1991). In the case of humanitarian intervention, the language used often frames the interventionist actions creating metaphors from the field of medicine. We offer humanitarian “relief, “injections” of foreign aid, and “prescriptions” for ameliorating unrest. These metaphorical frames show that bodies must behave in certain ways, thereby implicitly arguing that certain ideas about healthy bodies and lives must serve as a template for unhealthy ones. Humanitarian intervention is then about healing these “unhealthy” bodies. In medicine, “germs” are spoken of as “enemies” to good health. We are in “wars” against cancer. New research in AIDS helps us “conquer” the virus. In fact “militaristic language pops up in almost every scientific domain: conservation biology (‘invasive species,’ ‘biosecurity’); global warming (‘global war on global warming’); and biomedicine (‘killer cells,’ ‘hitting multiple targets’)” (Wenner 2007). This is from the Guardian’s News Blog, March 21, 2011: “8.13am: Yesterday we heard that supporters of Gaddafi had formed a human shield around his compound in Tripoli, with men, women and children singing songs against the rebel “germs” (Blog 2011). In the Sunday Times, Mark Franchetti interviews a soldier who says “The Iraqis are sick people and we are the chemotherapy,” said Corporal Ryan Dupre. “I am starting to hate this country. Wait till I get hold of a friggin’ Iraqi. No, I won’t get hold of one. I’ll just kill him.” (Franchetti 2003). What does this circulation do? A crucial point is that “[A]nalogies and metaphors are the often hidden devices that serve to rationalize choices of conceptual variants and to render plausible the narrative in which our political concepts are embedded” (Whitehead 2011, 293). In other words, by perceiving war and intervention as a “treatment” for sickness, we are blinded to other responses that may address the situation more effectively. These “hidden devices” can also invite and justify violent responses as shown above. Which metaphorical constructions make this circulation a possibility? What makes all these ways of speaking about intervention, states, and war, so compelling, so facile? How can it be made less facile? This art installation is an amazing attempt to inject (to use the metaphor against itself) this sterile understanding with ethics and morals. To make these inhuman ways of relating to others less facile. The victims aren’t bug splats or tumors, but children, men, women, wedding guests, and yes, sometimes even “terrorists,” but targeted killings are an ugly, immoral, and, more often than not, illegal business. It isn’t collateral damage, it’s murder. It behooves us all to put a human face on civilian deaths. Go to this site and read the names of the dead. Click on the above site and look at their pictures. A fascinating analysis which discusses the material power of medical and biological metaphors in practices of warfare and security. As a teacher of International Humanitarian Law to Australian Defence Force officer trainees, I can’t help but be disturbed by the way John Brennan describes the targets of UAV (“drone”) strikes in Pakistan. how might one actually test the impacts of word uses on people? Oh, and DARPA wants to make a metaphor machine. Stef, very cool stuff, I remember having my mind blown when reading Lakoff’s early stuff — I had no real idea that I was so militaristic in my metaphors (as an American) always “killing the lights” or “shutting down discussion” or what have you. A terrific source for that line of reasoning and illumination of the taken-for-granted metaphors we live by (and, in this case, die by). At any rate, getting to dmfant’s question, Lakoff is now, I believe, at a research facility working with neuroscientists to determine how these metaphors we use in everyday life, war, and politics map onto the brain. Now, I am not particularly moved by neuroscience, at least in my limited experience with the subject, it mainly gets reduced to “look, that part of the brain was activated” as if that was, in itself, something valuable to learn. As a pragmatist and closet behaviorist, I am more worried about what people do. It seems to come down to this: if we want to change the metaphors folks use (or if we want to find a way for them to voluntarily de-select such metaphors), then we either need something of a intellectual campaign (almost like metaphor exposure therapy) or we need a vialbe alternative (after all, these men and women that work in the drone strike world are being asked to do something that requires a modicum of dehumanization in order for the striker to retain a modicum of theirs). Evidence of existence — via large scale art specifically for strikers to see — goes a long way (not nearly far enough) to show evidence of humanity. I wonder if a direction for research would be to find out what images are the most humanity-inducing to the particular type of person that becomes a striker and then offer this material up to those being targeted … although, somebody doing that might find themselves the target of a drone strike. and I’m always surprised how folks that are otherwise invested in systems/ANTish investigations of other areas are taken by these kinds of abstractions. Lakoff’s work has gotten increasingly cartoonish but Johnson went exactly the other way and is now one of the leading thinkers on embodiment/pragmatism, wonder what makes the difference? poner click here en común sus recursos.